A favorite speech line of the Presidents’ during the 2008 Presidential and 2010 Congressional campaigns was asking people why they would return car keys to an administration that ran the vehicle off the road and into a ditch. It always got uproarious laughs and shouts of agreement from the audience. Well guess what? 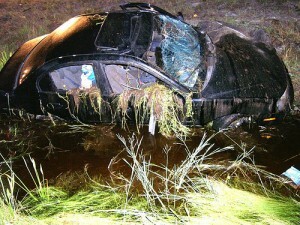 Four years later the car is still in the ditch except it’s also been stripped. No tires, no doors, no dash , no electronics and no steering wheel. Pretty much representative of the state of our economy. Wow 16 trillion in debt didn’t get us much ! Does the President still want to take credit for the keys? Hardly. Turns out he doesn’t even know how to drive. After spending several trillion dollars trying to get it towed he’s decided to sell off the working parts for salvage and distribute the proceeds among everyone. In his next term he will spend a few more trillion to pull the car out, fill in the ditch and drive the car the socialist way . 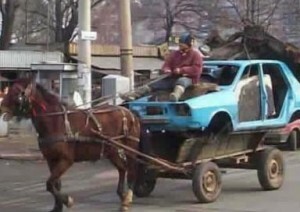 Horse power with no pollution. Just like Greece! This entry was posted on August 31, 2012 at 4:50 pm. You can follow any responses to this entry through the RSS 2.0 feed. Both comments and pings are currently closed.